With the arrival of a beta 4 update this morning, Apple TV finally got a little a UI makeover. 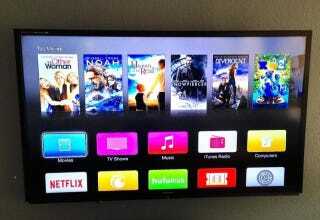 It looks like Apple TV is finally catching up with iOS 7. The redesign is not totally dramatic—and for now it's for developers only—but there's a new emphasis on colors a la iOS 7, and apps including Movies, TV Shows, Music, and Computers all have new redesigned icons. Overall, icons have been made flatter too, in line with Apple's new design standards. On top of that, Apple TV now uses the Helvetica Neue typeface Apple introduced with iOS 7. You should see it hitting your Apple TV around the same time iOS 8 hits this fall.